Reality call to DNJournal.com: What’s with the puff piece on Future Media Architects? I’ve been doing some domain research lately for Foliovision.com. One of the great sources of information for the domain industry is an online publication called DNJournal which does a weekly roundup of the top domains sales. Very useful information. DNJournal also publish a number of interviews with top domainers (people whose primary economic activity is buying and selling domain names). Just 2 years after entering the industry, AL-Ghanim has amassed more than 12,000 quality domains, including jewels like media.com, multimedia.com and fm.com. He has thriving websites like mp3.tv, dj.net and oxide.com and he has just purchased a major ICANN-approved internet registry that will be located on another showcase domain, i.net. No wonder domain industry forums are buzzing with questions about “Elequa”, a childhood nickname the 32-year-old internet phenomenon uses for his online identity. They want to know who he is, where he came from and how he assembled one of the world’s most impressive portfolios almost overnight. They wonder how he seems to be everywhere at once and almost always in the right place at the right time. How is it possible? Easy really…he never sleeps. AL-Ghanim is a self-described insomniac who naps only an hour or two each night. While you are sound asleep, he is busy transforming his vision for his current projects into reality. AL-Ghanim says he is so excited about his work he simply can’t gear down long enough to spend much time in bed. Fueled by that adrenaline rush, he has worked around the clock to cram four years of effort into two years on the calendar. Is it any wonder he is racing far ahead of the pack? Answering the common question, “who is Elequa?” is not as simple….the lines begin to blur and you have to ponder the composition much as you would an abstract painting. He is a businessman, an internet visionary, an artist and sculptor. By applying all of those skills to the domain industry canvas, he has become the world’s most prolific “domain artist”. ….His mp3.tv sponsored Italy’s national championship Ferarri racing team. Seeing his logo emblazoned on a car roaring by at 200 miles per hour is a perfect metaphor for the full-throttle approach AL-Ghanim is applying to the domain business. AL-Ghanim also attracts attention from jealous competitors. One recently posted in a forum that anyone could accomplish what AL-Ghanim has if they had enough money. The critics conveniently ignore the dozens of internet entities that had more than enough money in recent years, yet failed miserably. AL-Ghanim personally formulates the concept for each FMA website and then painstakingly develops them into something special. Perhaps the critics should ask themselves if they could paint like Michaelangelo if only they had enough money. What can one say? A hero of our time. The sections in bold are highlighted by me. Okay Mr. Jackman, who are you writing about Saladin, Zorro or a domainer (a guy with a computer buying domains)? This piece dates from 2003. We are now in April of 2007. 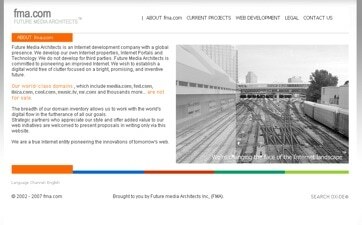 Let’s start our fact-checking by having a look at the home page for Elequa’s company Future Media Architects fma.com. Mmmm. Attractive to look at. Future Media Architects is an Internet development company with a global presence. We develop our own Internet properties, Internet Portals and Technology. We do not develop for third parties. Future Media Architects is committed to pioneering an improved Internet. We wish to establish a digital world free of clutter focused on a bright, promising, and inventive future. Our world-class domains , which include media.com, fed.com, ibiza.com, cool.com, music.tv, mr.com and thousands more… are not for sale. Let’s revisit Al-Ghanim/Elequa’s accomplishments for this period of time. Mr. Jackman, your “visionary, artist and sculptor” is no Michaelangelo. He is buying domains with Kuwaiti oil money and hoarding them for the future. It may turn out to make economic sense (the prices for high end domain names in 2003 were depressed) but it’s not a very inspiring story. Poor quality handling of prolific typein traffic. Ron Jackman, your article is a raspberry. This ladies and gentlemen is your introduction to the domain industry.